I was looking at some pictures from one year ago - getting misty-eyed at first day of kindergarten and preschool pictures, I'll admit - and noticed I had some fun pictures of crafts we made for storytime at my old bookstore gig. I thought I'd share a couple of favorites. August 2011 was apparently a creative month for me. 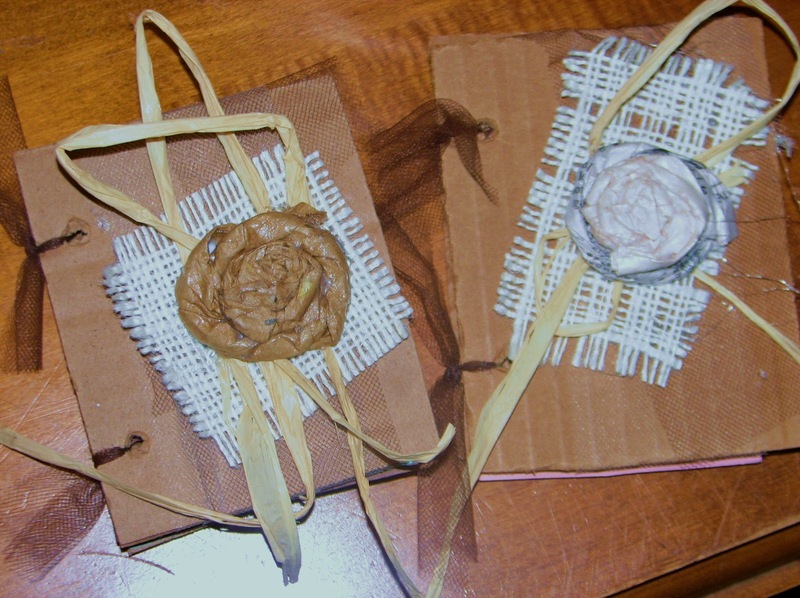 We usually made example crafts at home on Friday evenings. These pictures are of sample books we made for a book-themed storytime, in which I read How Rocket Learned to Read by Tad Hills and Calvin Can't Fly: The Story of a Bookworm Birdie by Jennifer Berne, illustrated by Keith Bendis. I highly recommend both books, by the way. These were super-simple to make. I cut up some old magazine boxes, used a pointy-ish object (a ballpoint pen) to punch holes in the cardboard, then cut some card stock to fit the cardboard pieces. A hole punch worked fine for the card stock. 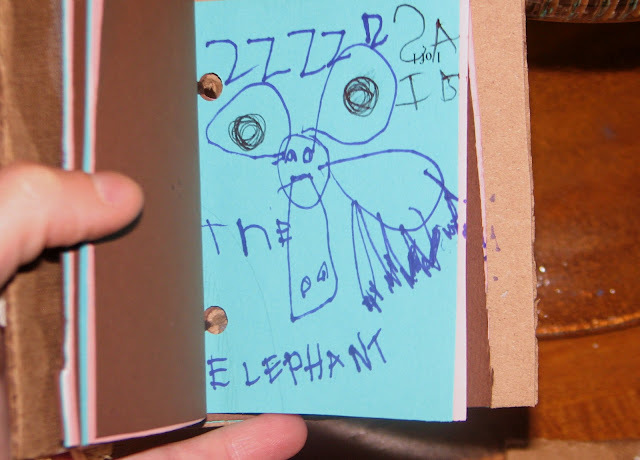 I wound up making one more dummy, which was simplified quite a bit - we wound up using yarn, stickers, markers, and buttons to decorate our books at the store. As you can see, Big Sis's book was ready for publication! We read Caps for Sale and Circus Caps for Sale by Esphyr Slobodkina at another storytime. 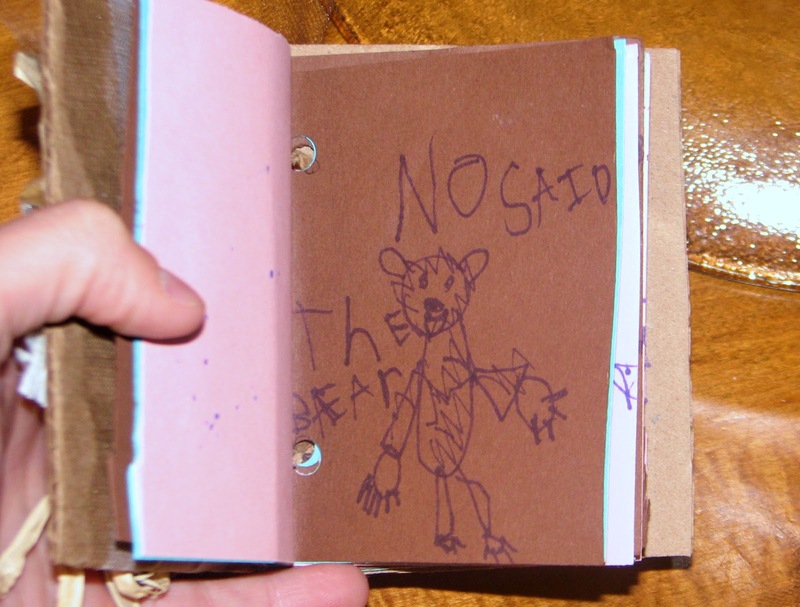 This was one of my all-time favorite crafts. We made our own hats! The idea came from several different websites. 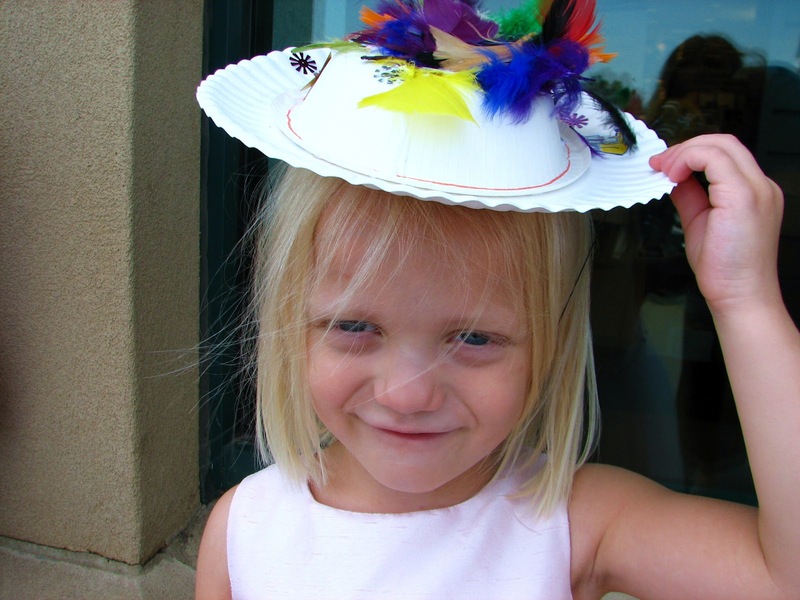 It's a popular paper plate (and bowl) craft. 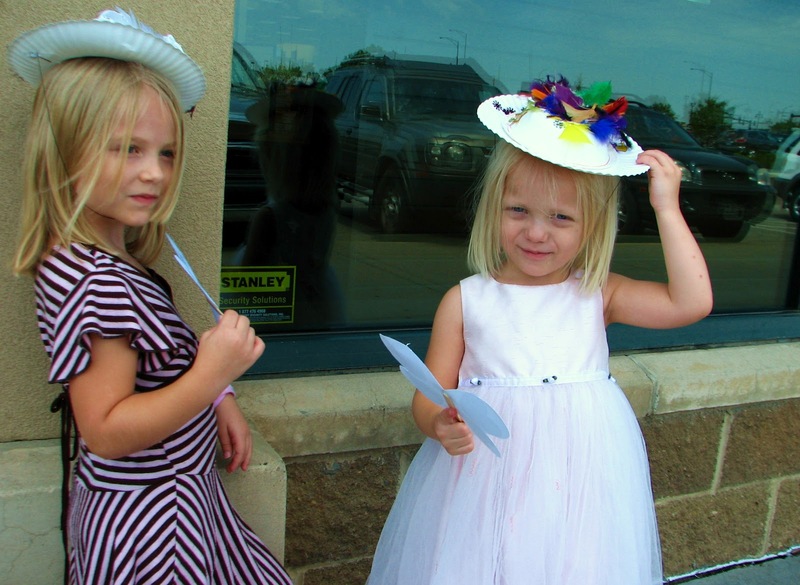 My girls had very fancy hats by the time they were through. Just take a paper plate. Cut out the center. Now glue a paper bowl, upside-down, on top. Attach some elastic and voila! The butterfly fans were left over from a Mother's Day craft, I believe. There were a few left in the supply box, and the girls decided they went well with their hats. Every year, Big Sis's elementary school does a hat parade. 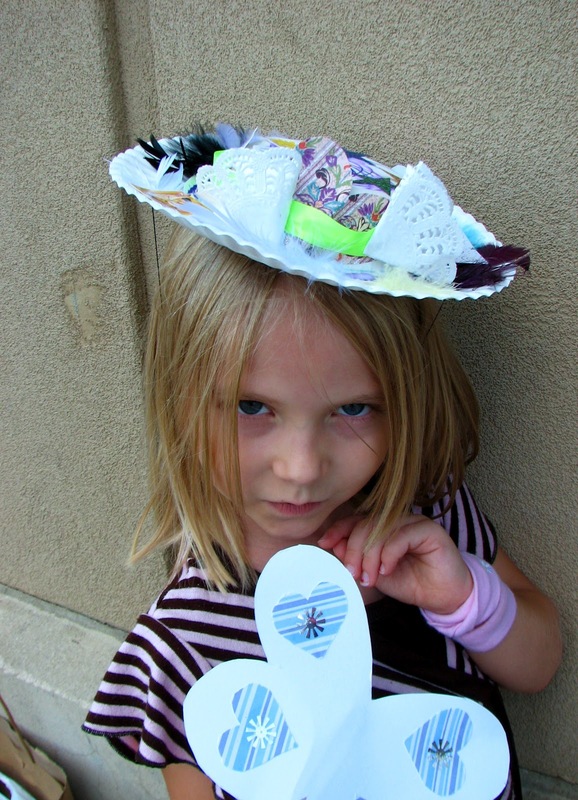 The children have to make their own hat, with help from their families, fitting that year's theme. I had a few cut-up plates left, so Big Sis's hat was already begun! I've also noticed this hat style is popular for Madeline storytimes and parties. It does look a bit like her hat, doesn't it? We need to start making the hat for this year's hat parade soon. The theme is "What will I be when I grow up?" Big Sis is leaning toward becoming a teacher or librarian (or school librarian! ), although she hasn't ruled out entomologist quite yet. I think we're going to paint a paper sack this year, with the bottom turned up for the brim. I'll post pictures when it's done. Cute! And I love the idea of a hat parade! I missed the hat parade last year, so I'm very excited to see this year's parade! They totally look like Madeline hats!!! So Cute!